This is a sponsored collaboration with Dime Media and the National Pork Board. The recipe, pictures and opinions are 100% my own. 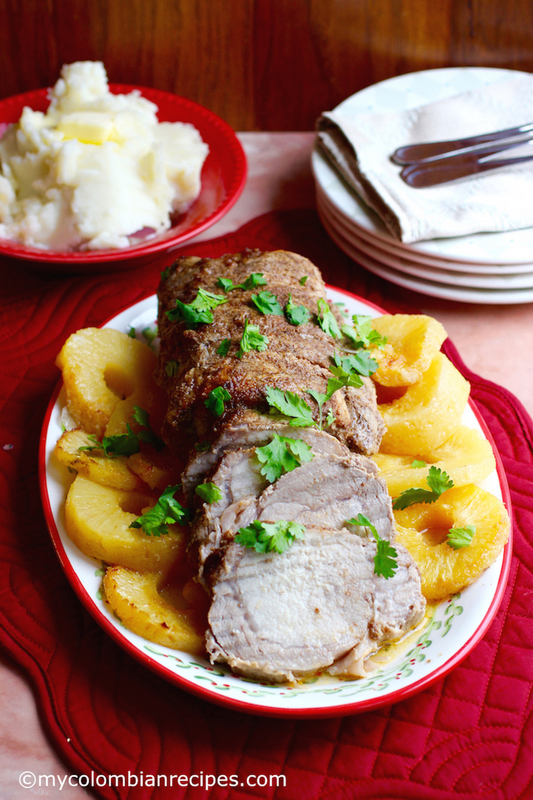 Pork roast is a signature dish in Colombia and other Latin American countries during the holidays, every country making its own variation. Growing up in Colombia, my family would gather at my Grandmother’s house on Christmas Eve for our traditional noche buena meal and then again on New Year’s Eve to celebrate Mamita’s birthday and to welcome in the new year together. While there were many different dishes on the table, the star of dinner was always a pork dish. It may have been pernil, lechona or cañon, but without fail, we could always count on a great pork dish, which was my grandmother’s favorite kind of meat. 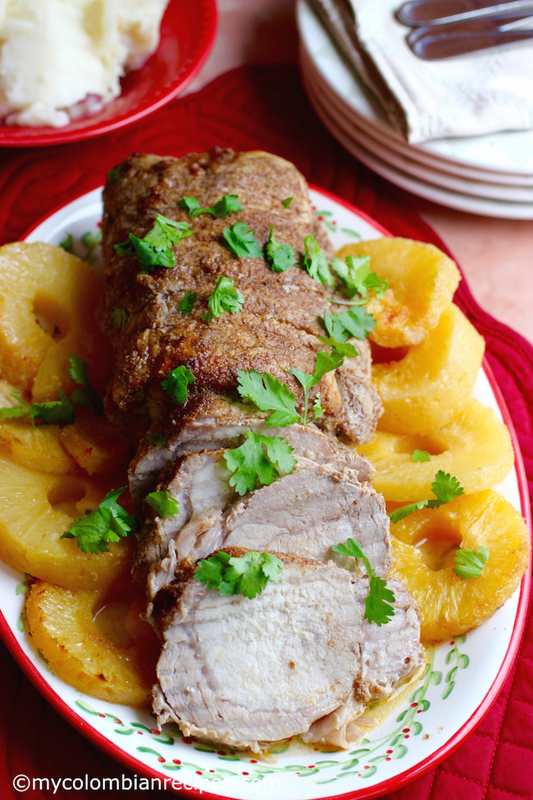 This Pineapple Roasted Pork Loin recipe is one of the recipes that my Mamita made and it’s one of my favorite ways to cook pork. 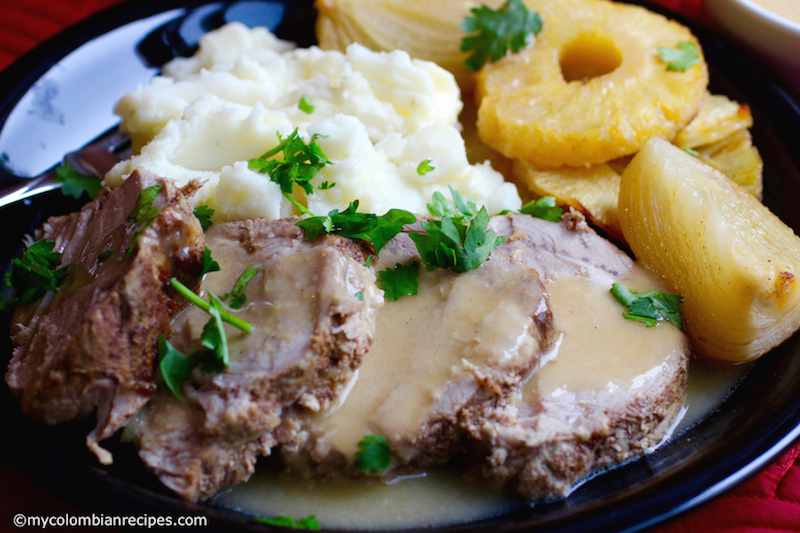 It’s made using a large pork loin roast, which is rubbed with a seasoning mix of ground cumin, ground cinnamon, onion powder, paprika, garlic powder, oil and salt, then baked in pineapple juice with fresh pineapple slices and onions. 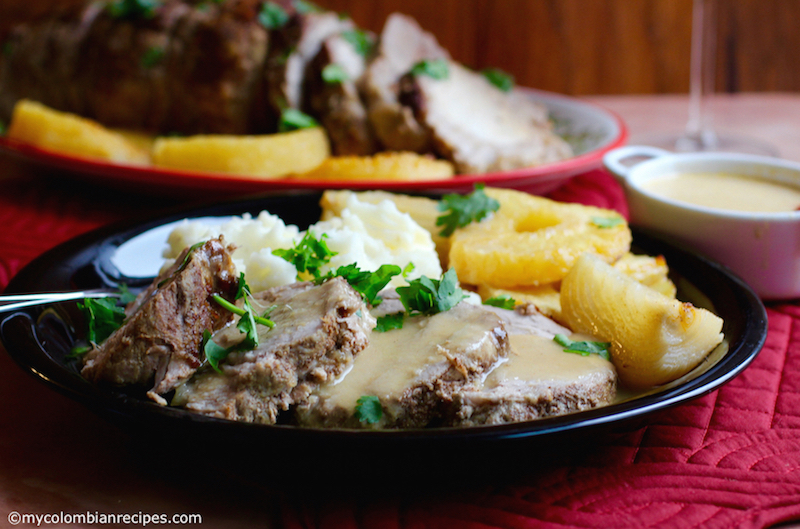 The roasted pork is served with a pineapple sauce made by reducing the roasting juices and adding heavy cream and corn starch. This is a delicious celebratory dish, full of flavor that suits all occasions and festivities and is sure to be the star of your dinner table. By the way, the leftover pork makes for great sandwiches too! 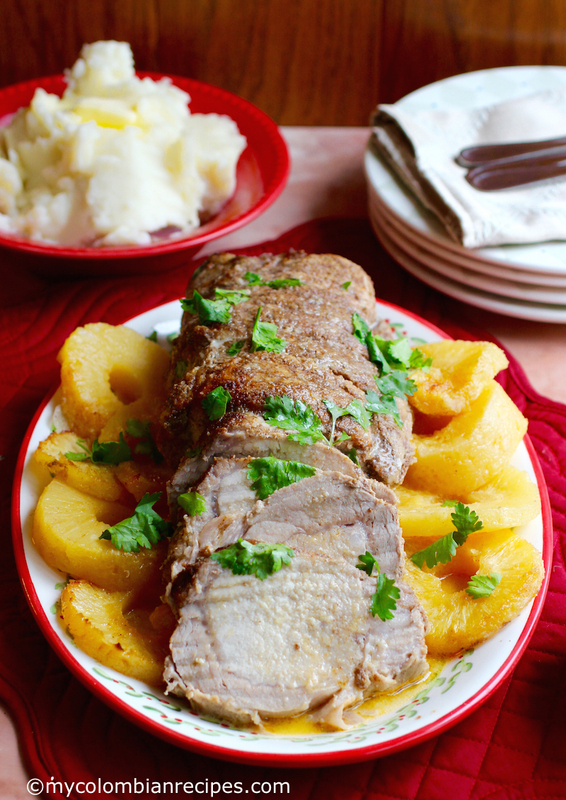 I hope you enjoy this pork roast recipe as much as I do. From now until the end of the year, ”get inspired to give back with pork” by visiting porkteinspira.com/inspirateadar to create your own personalized greeting card to share with your love ones on social media throughout the holidays, that not only looks good, but also does good. The national Pork Board will donate one pound of pork to charity for every pork inspired greeting card shared. ¡Inspirate a Dar con Pork! The idea is called ‘Porksgiving’ because there’s no better way to say thanks to someone who gives back than with a home-cooked meal. 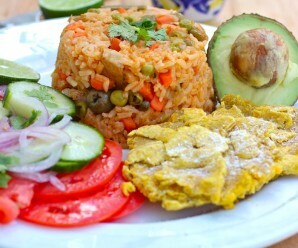 And as Latinos many of us know that there’s no better home-cooked meal than one made with pork! Mix the seasoning rub ingredients in a small bowl. Tie the pork loin with cooking twine. Rub the pork loin with the seasoning mix. Place the pork in a large roasting pan. 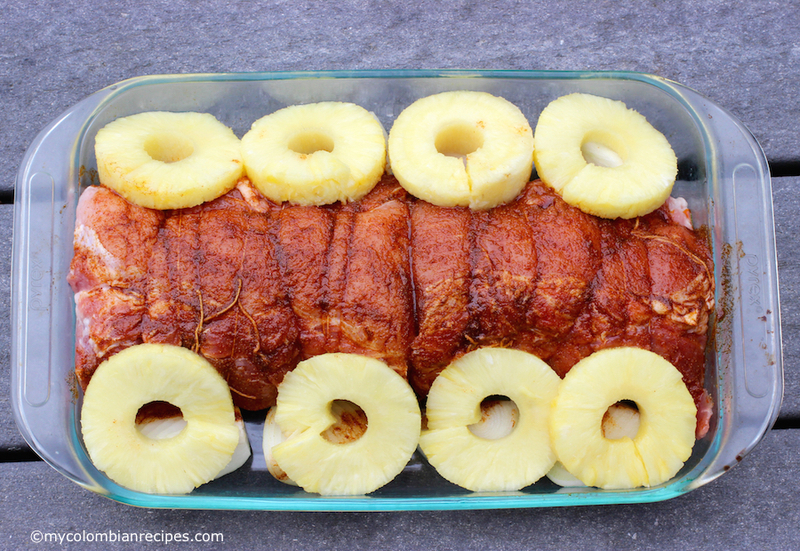 Arrange the onions and pineapple slices around the pork loin. Pour the pineapple juice into the pan. Bake at 400 F for 40 minutes. Cover the pork with aluminum foil and lower the oven temperature to 350F. Baste the pork loin with the juices. Bake for about 1 hour and 20 minutes, basting every 20 minutes. 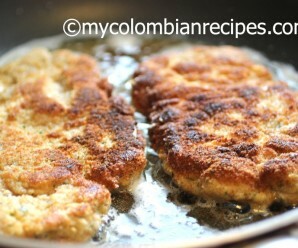 Take out of the oven, add the butter and let the pork rest for about 10 minutes before cutting and serving. Meanwhile make the sauce: Strain the pan juices into a small pot and cook over high heat for about 15 minutes. Add the cream and corn starch. Let the sauce cook over medium heat until it starts to thicken. 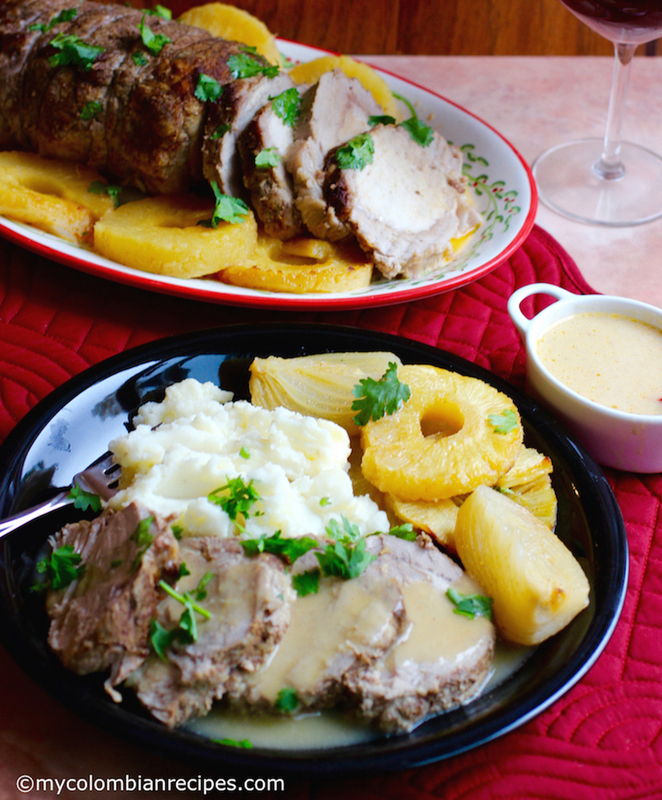 Slice the roasted pork loin and serve with the pineapple sauce and baked pineapples and your choice of side dishes. Erica, this is a wonderful roasted pork dish. 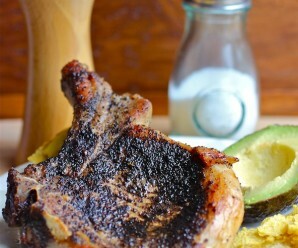 Pineapple is a really companion to pork too. Love the dish. Hi Erica from Spain. We always use pork loin and I usually buy a complete cinta de lomo and take two or three roasting joints and then cut the rest into steaks. Any trimmings get ground and used for sausages but I may, try mixing with some beef to make your stuffed meatloaf. One of our preferred ways of using the loin roast is to spiral-cut it and then stuff it with various fruits and nuts or with sage and onion stuffing. After taking a certain amount of cold roast as cold-cuts, the remainder gets ground with onions carrots and herbs to form the base for shepherds pie. 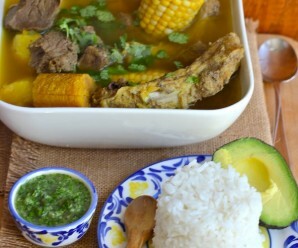 I have always been a big fan of pork so loving this dish, I would be perfect for the holidays. I also like pairing pork with fruits but never thought of pineapple, great idea. pineapple and pork taste wonderful together! this is a wonderful entree.